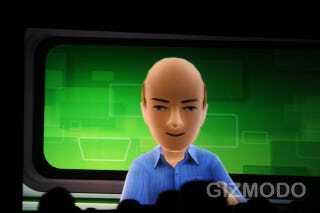 Your Xbox Live avatar leads a lonely existence. Or did, anyway, before Avatar Kinect came along. Now, Kinect recognizes your face: When you smile, when you raise your eyebrows, when you talk—and your Avatar uncannily does the same. It'll be available this spring for free—free!—to Xbox Live Gold members. Oh, and Microsoft has managed to sell 8 million Kinects since launch. Not too shabby!